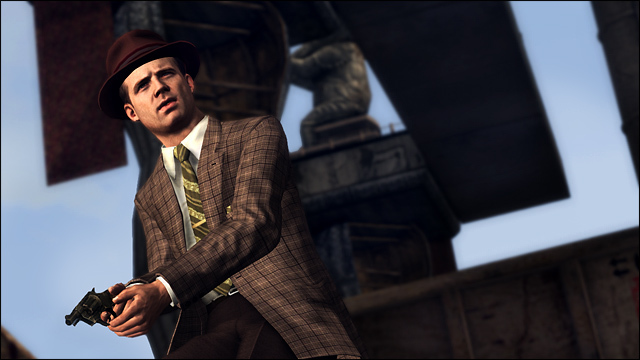 Sean McGowan – (L.A. Noire – 2011). by Matt J. Horn in Sean McGowan - (L.A. Noire - 2011). Hey Sean. Thanks for taking the time out to talk to me. ‘LA Noire’ is currently in gaming stores right now. For anyone who hasn’t had the chance to play it, how would you sum up the plotline? Basically ‘L.A. Noire’ is built around the ‘Golden Age’ of Hollywood. You play as LAPD detective Cole Phelps. Amid the backdrop of bustling post-war Los Angeles, Hollywood-land, and a thriving Jazz community, everything is falling apart due to corruption of the system. Drugs and murder are at an all time high and your job is to do your part to set things right. It’s one hell of a ride. Well first of all I’d say I played him, I didn’t voice him. ‘LA Noire’ was created using the newest and most cutting edge MotionScan technology. All the actors that were brought in actually played their characters. The 3D technology captures our performance right down to the nuances of our face. It’s what makes the game so cool and it’s a big leap away from previous games where the character was created by a computer and the actors were merely the voice. It was one amazing operation. As far as my character goes, your thumbs control Detective Cole Phelps and I play his partner Detective Stefan Bekowsky. Bekowsky was a hoot to play. A sarcastic, outspoken cop who loves a good fight and a good joke. Have you had chance to see the trailer / play the game yet? What did you think? Over the year or so that we worked on the game we were able to play it at different stages to give us a clear understanding of what we were actually doing. The Team Bondi /Rockstar guys were great about that. Of course once the game was finished I was just as excited as everyone else to see how it turned out. To be honest… I was pretty blown away. I’m a “gamer” myself and this was like nothing I had ever seen before. How did you get involved with the project in the first place? What was it about the project that made you want to say ‘yes’ to it? Like many parts we play it all starts with an audition. I was asked to come in specifically for Bekowsky and loved him from the start. Some characters you play really “live” inside you. Sort of an instant connection or love at first sight. Which was one of the reasons I was so keen on playing him. I also love period pieces. How often do you get to walk around in real life saying things like “Can it sister”, or “I think he slipped him a mickey”? You’ve gotta love that. The game has got quite a ‘film noir’ feel to it – are you a fan of the 1940s crime film noir epics? I have seen a handful of noir films and very much appreciate the style. I also think the 30’s and 40’s have a style that has been lost. It’s nice to see elements of it back. Let’s talk a bit about you Sean – what made you want to get into acting and voice-over in the first place? Long story short I was a football guy who lost a bet and had to audition for a play. Turned out I loved it and I was pretty good. Growing up a Navy brat I lived all over the world. With so many experiences open to me I had a hard time nailing down what I wanted to do when I “grew up”. I guess I just saw acting as a way to be everything – pilots, doctors, detectives, even complete assholes. What advice would you give to anyone who wants to get into either industry? If you want to be an actor do it. If you have the talent and you can afford the lifestyle (ie. living paycheck to paycheck and dealing with constant rejection) then do it. Acting is a hard industry but so rewarding once you get to work. If there is nothing else you would rather do then get yourself out to LA. NYC is great if you want to do plays but there are infinitely more opportunities in Los Angeles. Get an agent by proving to them that they can’t live without you and take every opportunity you can get. Everything is a learning experience. The small jobs can teach you a ton and stop you from screwing up when you get a big opportunity. Oh, and be nice to everyone. The guy working craft services could be directing your next film. What does a Sean McGowan day usually consist of? Work and family. If I’m not working on a job, I’m hanging out with my wife and son or I’m in our office writing and creating. Even when I am acting full-time, I will always continue to work on other creative projects. It’s what feeds me. You’ve been in many TV series and films – which has been your favourite project to work on and why? Honestly, it’s all good. I love to work. But thinking about it I guess I love location shooting. Last summer I shot a huge Japanese WWII picture called ‘Oba: The Last Samurai’ for 6 weeks in Thailand. I speak Japanese and played the American lead. It was just amazing being part of something so epic. You’ve just finished production on two films – ‘Fortress’ and ‘To The Wall’ – what can you tell us about these two projects? ‘To the Wall’ is a movie about two men from opposite worlds trying to find out more about their fathers who died in Vietnam. I play one of the fathers. It’s a very moving story about the connection between fathers and sons. I’m looking forward to seeing the finished product. ‘Fortress’ was a blast of a shoot. It’s about the first all Irish American crew of B-17 bombers who flew over Italy in WWII. It’s a coming of age story where I play Archie Mason the navigator and jokester – a running theme I guess. ‘Fortress’ just debuted at the Cannes Film Festival and apparently did very well. Keep your eyes open for it this year. In mid June I head to Alabama to shoot a drama called “Hell and Mr. Fudge”. I get to play a villain this time who also happens to be a southern preacher. Bad guys are great to play because you get to behave in ways you wouldn’t normally and suffer no consequences. How fun is that?! Previous Sondra Currie – (The Hangover: Part II – 2011). Next Matthew Alan – (L.A. Noire – 2011).